Happy New Year from Discount School Supply! On behalf of Discount School Supply, we hope that you are having a wonderful and safe winter holiday. While you are enjoying your holiday time, we are diligently preparing to meet your needs for 2011. Your budgets are always a priority, so Discount School Supply is working hard to help you stretch your budget in the new year. When you need top quality early educational supplies at the most affordable prices, Discount School Supply is your place to shop. Colorations® Extra-Large Crayons - Set of 50 for ONLY $8.99! These beautiful, bright crayons offer exceptional quality for such an incredibly low price. Big boxes are a must for every classroom. Set includes 5 each of 10 brilliant colors. Ideal for students ages 2-4 years. Soft Velour Blocks - Set of 24 for ONLY $27.95! These soft velour large foam blocks are machine washable and will retain their color and brilliance through many washings. The set contains arches, cylinders, rectangles, squares and triangles. Perfect for toddlers! Wooden Birthday Party Set for ONLY $18.99! Make everyday a celebration with this birthday party play set. 34 wooden pieces easily attach with hook and loop. This set is a festive addition to your dramatic play area and includes 6 ready-to-cut cake slices, removable candles, toppings, serving tray and spatula. For ages 3 years and up. 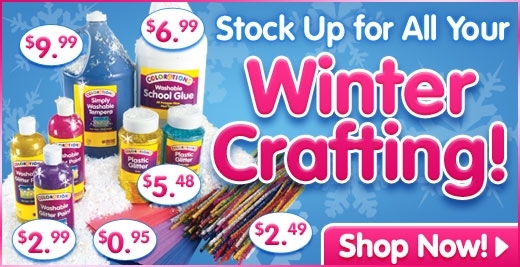 Kick off 2011 with more great savings from Discount School Supply when you shop right here. Shop for more top rated products at the most affordable prices every day at Discount School Supply. Choose product categories like Arts and Crafts, Manipulatives, Dramatic Play, Active Play, Infant and Toddler, Furniture and more! Happy New Year and Happy Savings from Discount School Supply! It's not quite 2011 yet but at Discount School Supply, we are anxious to showcase our new product selection. Visit our New Arrivals section right now and find top quality educational materials for early learners at the most affordable prices. Teachers, caregivers, parents and center directors: shop for new products in a variety of product categories including Arts and Crafts, Active Play, Dramatic Play, Curriculum Supplements, Infant and Toddler, Furniture and more. Giant Plush Stacking Ring - 20-1/2"H for ONLY $24.95! This colorful, plush stacking ring teaches size and shape while helping little ones develop problem solving, spatial relations and hand-eye coordination. Great for sensory stimulation and exploration and perfect for babies who cannot stand, but will be able to stack rings on the pole. The Giant Plush Stacking Ring is large enough for multiple children to play at once. Laminated Specimen Set - 28 Pieces for ONLY $29.99! Bring the outdoors inside with an incredible and varied set of specimens for study. Specimens are safely encased for the classroom use. Use with light tables, microscopes, magnifying glasses or simple observation. Laminating film surface allows children to feel edges of plants or wings inside. This set will last over time and real specimens will remain in tact. Exclusive to Discount School Supply! Easy Grip Stampers Mega Pack - 50 Pieces for ONLY $29.99! Gigantic pack of 50 designs is perfect for large group activities. Durable easy-grip stampers have 3" clear base so children see where they're stamping. The jumbo 2" handle is sized right for children to manipulate. Use with Colorations® stamp pads, paint or markers. Another item that is exclusive to Discount School Supply! Visit the New Arrivals section at Discount School Supply right here for more outstanding new products. You are sure to find a great deal on a great new product that will enhance the learning experiences for your little ones. See for yourself! Get a sneak peak at all of our new products for 2011 available right here! Safety is the top priority at Discount School Supply. Whether shoppers wish to avoid products with common allergens, purchase items that are age appropriate and/or shop by certification standards, Discount School Supply makes it easy to find what you need. Teachers, parents and caregivers know that Discount School Supply offers the highest standards of quality and many of our products are certified by quality control agencies. One such certification is issued by the GREENGUARD® Environmental Institute which certifies products and materials for low chemical emissions for indoor environments. All GREENGUARD® certified products must meet stringent standards, and for products intended for use in classrooms or day cares, the GREENGUARD Children & Schools(SM) Certification Program requires even stricter certification criteria. Discount School Supply is proud to offer many GREENGUARD Children & Schools(SM) certified products. Angeles® Premier™ Cots are also the only cots with continuous fabric corner to corner - no gaps. The Sof-Tex® fabric is specially woven for Angeles® to precise specifications. Cots include a 10-Year Guarantee on all parts including the cover. Angeles® 2" Super Rest Mats are made to last! Save dollars, shopping time and the trouble of replacing ripped rest mats. The cover is virtually tear-proof because of the nylon mesh sandwiched between two layers of heavy-duty 3-ply vinyl. These rest mats include a 5-Year Guarantee. Find more Angeles® cots and rest mats certified by GREENGUARD® when you visit Discount School Supply right here. Quality you can trust and prices you can afford, available at Discount School Supply. And don't forget: Discount School Supply also offers top quality products for Arts and Crafts, Active Play, Dramatic Play, Furniture, Manipulatives, Curriculum Supplements, Infant and Toddler, Special Needs and more. Visit Discount School Supply today! Review: "I am very pleased with the quality of this doll. He has a very sweet expression and is very lifelike. I bought it as a gift for my grandson, whose mother is expecting another baby and thought her son might enjoy his own baby. My son had a baby boy doll when he was young, and now he is the wonderful father of 3 boys of his own!" The Multicultural Newborn Baby Dolls have amazingly lifelike features along with moveable arms, legs and head. Dolls are made of soft molded plastic. Designed with closed-off bodies to prevent water from traveling during bath time. Dolls measure 17" tall and are anatomically correct. Ages 2 years and up. Holiday shopping for the little ones is both easy and affordable when you shop the Holiday Gift Guide at Discount School Supply. Not only will you avoid the lines and the crowds when you shop online, you can easily shop the Holiday Gift Guide at Discount School Supply based on the interests of your little learners. Find terrific gifts for young builders, explorers, crafters, readers, imaginative players and more with the Discount School Supply easy-to-shop Holiday Gift Guide! Best of all, you can save 10% OFF everything in the Holiday Gift Guide when you use code GIFTSALE at checkout. Doesn't that sound just perfect? Great gifts, affordable prices and no tedious trips to the mall! It's all possible with the Holiday Gift Guide from Discount School Supply. Wonder Eye Jumbo Magnifiers - Set of 3 for ONLY $13.95! See the world even closer with this exclusive Wonder Eye Jumbo Magnifier set. Wonderful for indoor or outdoor exploration, perfect for your classroom science center and a great value! Colorations® Cooperative Jumbo Classroom Spiral Designer for ONLY $9.99! This spiral designer is the perfect cooperative art project! One child holds the art track in place while another moves the rings around the inside to create spiral designs. Tool Time Work Bench for ONLY $57.99! Building and fixing is made easy with this 34-piece set which includes a work bench, "wood" pieces, screwdriver, screws, bolts, nails, hammer, pliers, saw, caliper, working vise, pegs and hangers for the pegboard. The assembled size is 24"W x 15"D x 37"H and the bench is 23"H. Some minor assembly required. Find the perfect gift for your little ones at the Holiday Gift Guide at Discount School Supply. Shop by children's interest, for example Likes to Build, Likes to Pretend, Likes Music and more. Click here to see for yourself. But you must act now! The 10% OFF Everything deal only ends soon. In fact, you only have four more days! And if you want your products to arrive by the holidays, then place your order this week! Shop Discount School Supply for all of your early education needs like Arts and Crafts, Furniture, Manipulatives, Active Play, Dramatic Play, Curriculum Supplements and more! Visit Discount School Supply today! Whether the weather is hot or whether the weather is cold, you will have a great way to keep track of dates, holidays and the weather for years to come with the Classroom Calendar and Weather Center. Best of all, it could be yours for FREE when you enter the Calendar and Weather Center Giveaway going on right now at Discount School Supply! At Discount School Supply, we are continuing to celebrate our 25 years of business. Just in time for the new year, Discount School Supply is giving away 25 new Classroom Calendar and Weather Centers! You could win one of them! Entering to win is very easy. Just visit the contest entry page on the Discount School Supply website right here. Fill out the form and that's it! You could win a Classroom Calendar and Weather Center for your classroom, home or learning center. The Classroom Calendar and Weather Center is a calendar pocket chart that makes keeping track of dates, holidays and the weather a fun and interactive way to start the day. Children will love dressing the chart's weather mascot, the Weather Kid, and they can practice for their own dress-up play when they match the Weather Kid's clothing (included) to the day's weather. There is also a bilingual version available in Spanish! The Classroom Calendar and Weather Center is an exclusive product to Discount School Supply and it could be yours for FREE! Visit here right now to enter! Moms, dads, teachers and caregivers: be sure to visit Discount School Supply any time you are shopping for affordable and high quality early education supplies. Discount School Supply has all the great stuff you need for less! Shop Arts and Crafts, Furniture, Manipulatives, Active Play, Dramatic Play, Infant and Toddler, Curriculum Supplements and more! Be sure to enter to win a Classroom Calendar and Weather Center. Hurry! This contest ends December 17th! Enter to win right here right now! Review: "I use this product in my Montessori preschool, and it works perfectly to teach about graduation of weights. The older children love to wear a blindfold, then match up the weighted pairs, and the younger children use the colored dots on the bottom of each pair to learn the different weights. It's just great." Find the matching pairs in this wooden Weight Box. Place the weights in the tray with the color dots up, and children can choose the pairs by color. Or, place them in the tray color side down, and children can find the matching pairs by comparing weights - self-correcting when the dots on the bottom are compared! Includes 12 cylinders (6 pairs), each marked with a color dot. Tray measures 6 1/4" x 7 3/4". Each cylinder measures 2 1/4"H x 1 1/2"Dia. The end of the year is upon us and it is time to clear out the Discount School Supply warehouses in time for 2011. What does that mean for you? Massive discounts during our end of year Clearance Sale! Make no mistake: now is the time to save big at Discount School Supply. Save up to 66% more in our Clearance Center right now! Jewel Collage Buttons - 1 lb. for ONLY $5.99! These translucent buttons, in gorgeous colors, add to traditional crafts for a spectacular new look. Buttons measure 1" and there are approximately 100 pieces. Polar Adventures - 15 Pieces ONLY $9.99! Take an arctic adventure with this 15-piece set of polar animals and figures including penguins, seals, igloo, sled and more. The plastic pieces are durable and built to last! Crayola® Regular 16 Color Crayon Classpack® ONLY $55.99! Crayola® Classpack® includes 13 durable, reusable desktop bins - and even two classroom sharpeners! 16 colors in 52 sets, including black, blue, brown, green, orange, red, violet, and yellow, plus blue green, blue violet, carnation pink, red orange, red violet, white, yellow green and yellow orange. But those aren't the only deals going on during the End of the Year Clearance Event. Find savings of up to 66% when you shop the Discount School Supply Clearance Event right here! Arts and Crafts, Manipulatives, Furniture, Curriculum Supplements, Dramatic Play, Active Play and more are on sale at Discount School Supply. Now is the time for moms, dads, teachers, caregivers and center directors to save big while supplies last! Shop the Clearance Center at Discount School Supply today! Looking to save some money on early childhood education supplies? How does saving more money than you spend sound? It's all possible when you shop the Extreme Bargains sale going on at Discount School Supply right now. During the Extreme Bargains sale at Discount School Supply, you will find hundreds of items all with savings over 50%! Colorations® Washable Watercolor Classroom Pack - 28 Sets for ONLY $39.99. Comparable sets go for $136.99 which means you save 70% or $97! Incredible! With 28 sets for one low price, there is enough for the entire classroom. The handy durable cardboard pack provides a perfect storage solution for all your classroom watercolor trays and refills. This set includes 28 washable watercolor trays with brushes and 13 washable refills. Colors include: black, blue, brown, green, orange, purple, red and yellow. Best Value Unit Blocks - 110 Piece Big Builder Set for ONLY $62.92! Save $106.08 when you compare this with other builder sets. That's over 60% savings! These solid ruberwood unit building blocks encourage problem solving, enhance social and perception skills, promote shape and size recognition and teach basic math and science skills. All blocks are based on a unit measurement of 1 1/4" which gives each set complete uniformity for successful "architecture." Rainbow Dancing Wrist Bands - Set of 6 for ONLY $8.95! A comparable set of dancing wrist bands retails for $33.89 which means you save 73% or $24.94! These beautiful, flowing nylon ribbons of bold and bright colors will enhance dancing, racing or any gross motor activity. Each measures 34" in length. Teachers, caregivers, center directors, moms and dads: there are more Extreme Bargains at Discount School Supply right here. In fact, there are hundreds of great deals! Find Extreme Bargains in a variety of product categories like Arts and Crafts, Active Play, Dramatic Play, Curriculum Supplements, Furniture, Manipulatives and more! Shop Discount School Supply for top quality early educational supplies at extremely affordable prices. Save more than you spend during the Extreme Bargains. But you must act now. Extreme Bargains won't last forever! So check out the Extreme Bargains at Discount School Supply right now. Shop and save over 50% right here! Feel like an expert builder and mechanic! "One of our best purchases, ever!" Pros: Easy To Assemble, Durable, Colorful, Fun, Sturdy, "Spans Age Groups"
Review: I bought this for my 2 year-old son. He loved playing with the drill and taking the toys apart. My 4 year-old daughter loved putting the toys together. We were all impressed that it came with three drills and three screwdriver handles with interchangeable bits. Lots of kids can play at once! And, they can play in different ways. I then bought it for friends. Their 3 year-old son, and especially their 5 year-old son, loved it as well. I highly recommend it! The Build and Play Mechanic Set lets children make and repair a gliding submarine, helicopter, boat, train, racing car and airplane. Animated wheels move parts on the vehicles: engine on the racing car, propeller on the plane, blades on the helicopter, smoke stacks on the train, periscope on the submarine and smoke stacks on the boat. Includes 129 sturdy plastic pieces to create vehicles and six tools. Wonderful for encouraging cooperative, interactive play and building self-confidence. Available in colors shown. Instruction diagrams are included, but parts can be interchanged for creative play. Allows children to create three battery-operated drills and three screwdrivers to use and share in classroom setting. Also includes nine bits. Requires 6 AA batteries (not included). Completed pieces range from a 6 3/4"W airplane to a 5 1/4" tall helicopter. Ages 3 years and up.